View More In Differential Covers. aFe Power's new rear differential cover brings performance engineering to the protection of your axle's differential. This differential cover is constructed out of durable die-cast A380 aluminum with reinforced ribs and wrinkle black powder-coating with machined fins for maximum strength and styling. This cover comes with all necessary hardware and includes an O-ring for a leak-free seal. The Pro Series differential covers include a oil level sight glass and deep reach magnetic dip stick for maximum protection. 5 Quart Lube Capacity: This cover has about a 5 quart lube capacity at the factory line, factory cover holds about 4 quarts. Built-in Internal/External fins: Built-in internal and external fins transfer heat from the fluid to the outside air for maximum cooling. Magnetic Drain/Fill Plug: This system incorporates a magnetic drain plug to capture loose particles for maximum rear-end protection. Oil Level Sight Glass: Pre-installed large oil level sight glass with calibration plug set to the factory fluid level to eliminate overfilling. Group IV synthetic base: This competition proven formulation utilizes a group IV synthetic base along with a proprietary additive package that reduces drag, resist foaming and maintains its viscosity under extreme heat and high loads. 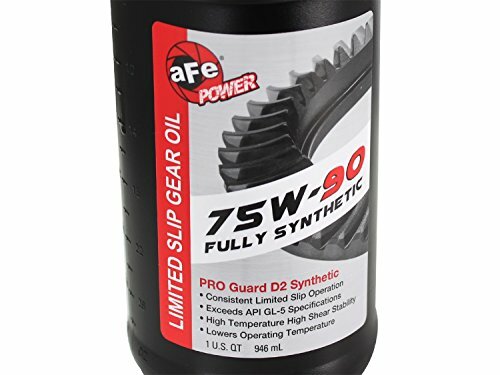 Usage: The PRO Guard D2 Synthetic 75W-90 limited slip gear oil exceeds the performance requirements of API GL-5 recommended for both open and limited slip applications. Note 1: Not for use in transmissions. Do not mix with other fluids. Note 2: This cover fits the AAM 11.50-14 Bolt Axles, see comparison photo below for verification. Also Fits: 2001-2015 GM Duramax V8-6.6L (td), 2001-2007 GM 3500 V8-8.1L, 2003-2012 Dodge/RAM Cummins L6-5.9L/6.7L (td), 2013-2015 Dodge/RAM Cummins L6-5.9L/6.7L (td) Note: Leaf Spring Models Only. When it comes to engineering for power, performance, protection and value, aFe Power is the only choice. If you have any questions about this product by aFe Power, contact us by completing and submitting the form below. If you are looking for a specif part number, please include it with your message.